In my opinion, this is the best-looking classic Firestorm action figure to date! Back in December 2004, DC Direct released a second series of their JLA action figures. 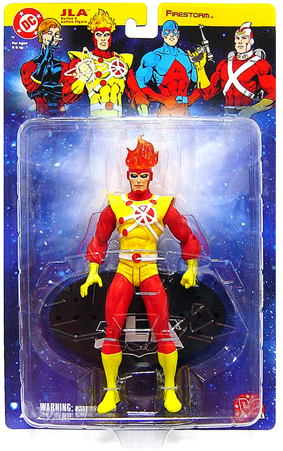 Series 2 included Elongated Man, the Atom, Adam Strange, and Firestorm. James Shoop did an amazing job on the sculpts for each of these figures! They truly look like the comic book character come to life. Here is the DC Direct JLA Series 2 Firestorm still on the card. I’ve seen it advertised recently on the card for as much as $40. Below is the promotional text DC Direct used to advertise the figure. You can also view the figure on the DC Direct web site. When Ronnie Raymond and his college professor Martin Stein were fused into one being in a nuclear accident, they became Firestorm, the Nuclear Man! 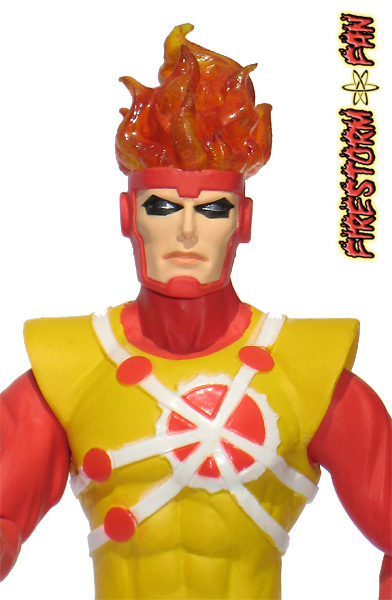 Able to alter the molecular structure of any object, Firestorm became a powerful member of the Justice League. 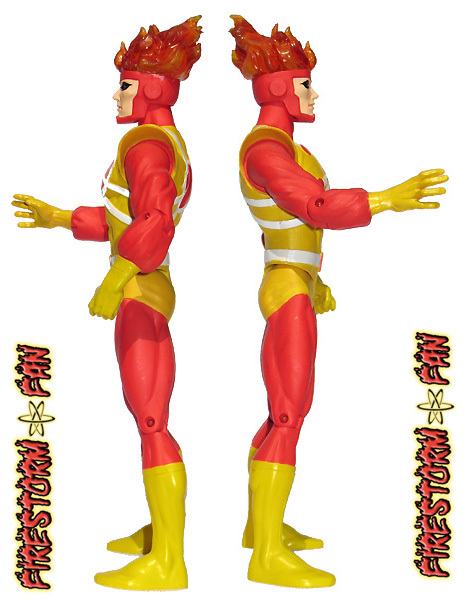 The FIRESTORM ACTION FIGURE stands approximately 7 1/4″ tall and has multiple points of articulation. This figure includes a JLA base and is packaged in a 4-color blister. While I still think this is the best-looking Firestorm action figure, there is one costume error I can’t help but notice. If you look at Firestorm’s chest emblem, there is a sun with three white lines radiating outward to the left and right. There are three red circles on the left-hand side, with one red circle on the right. That circle on the right shouldn’t be there. I know it’s an incredibly nit-picky error, but I couldn’t call myself THE Firestorm Fan without noticing something like this. One of the neat details of this figure is the hair. They used a translucent orange plastic to represent the fiery hair. It works really well and looks fantastic. As I started to write this entry, I looked over my review of the 1985 Super Powers Firestorm action figure. Even though the 2004 figure is better looking, it’s sort of disappointing the lack of tie-ins. The 1985 figure was part of a large cross-marketing event, whereas the 2004 figure is… just a figure. It would have been nice if the 2004 figure had been part of something bigger, but I guess it’s a fair trade-off; no big event, but we got a gorgeous figure. What do you think about the DCUC Firestorm? The one which was available in mass market stores? Well… I definitely have an opinion. And I feel differently about the Ronnie figure versus the Jason figure. However, I’ll be covering them both here in the next few months, so I’ll keep my mouth shut for now.